THERE is a one-third sized replica of the Eiffel Tower more than 300 feet high. There are elaborate fountains copied from the Palace gardens in Versailles. There's a huge shopping area named Champs Elysees Square. And there are thousands of empty apartments. This is Tianducheng, the strangest of China's infamous "ghost cities" – construction work started in 2007 on the city built to look like Paris right down to authentic-looking patisseries. It was constructed to house more than 10,000 people. Today the population is estimated to be about 1,000. Elsewhere in China at Donnguan City is the South China Mall – known to be the world's biggest shopping centre. It stands empty except for the tourists who come from all over the world to visit and take pictures. More unsettling for observers of ghost real estate is Ordos in Kengbashi, Inner Mongolia, a shining city almost as large as Dublin. Built to accommodate more than a million people, today's population is estimated as being under 70,000. All this time Ireland was troubling itself about "ghost estates" of 30 or 40 houses at a time, China was slapping up entire ghost cities with row upon row of gleaming 30-floor apartment towers that now stand as empty sentinels over China's fast evolving property meltdown. And, despite parts of China being hugely oversupplied with housing (it was recently estimated that 20pc of China's homes are empty), developers are continuing to build them. Not far from Ordos, construction crews are at work on yet another brand-new metropolis on a 130,000 hectare site. It's not yet clear who is going to live there. What we are witnessing is the mother of all property and fast-credit bubbles, which the world's economic pointy heads generally agree is about to go nuclear any day soon. 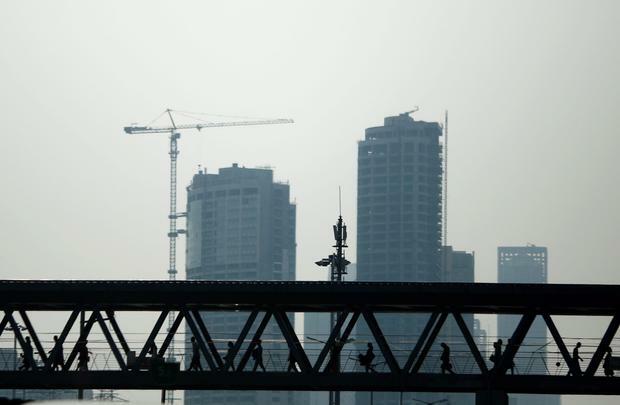 China's 10-year property building boom is the biggest in world history thanks to the rapid economic growth and urbanisation programme the giant economy has experienced through the past decade. The most populated country in the world with 1.3 billion people now has the planet's second largest economy and a surge in the standards of living have facilitated a huge property spend for ordinary citizens that simply would not have been possible at any point through China's history. The bubble has been further inflated by the fact that the government's two-tier communist/capitalist system has curtailed people from investing in much else but property. So invest they have, on a massive scale. Construction now accounts for twice the percentage of annual economic activity in China as it did in Ireland at the height of the Celtic Tiger's property boom. Some commentators have speculated that, with the fortunes of so many ordinary households tied into property, a bust which wipes out their wealth could even spark social upheaval. So why should the mother of all property crashes worry us here in Ireland? First consider that the collapse of the shadow banks (the sector accounts for 50pc of lending in China) and the Chinese economy overall will impact on the world's biggest economy – one of China's largest trading partners – the USA. If the USA sneezes we get a cold. Much of what US companies based in Ireland produce goes to China, albeit indirectly. With deflation raising its head in Europe many economists believe that a devaluation of the Chinese currency will hit Europe like an economic broadside – in particular the economies with the most debt (ahem) whose repayment requirements will grow substantially under continued deflation. The prospect of much cheaper imports from China will be a massive deflationary anchor in regions where prices have already been falling. There could be other indirect effects for Ireland. Chinese demand has been responsible for rapid growth in the BRIC economies and experts warn that these are likely to fall off a cliff. So there goes demand for Irish exports in these new markets (including China's) which have been pinpointed as key to pulling Ireland out of the mire. Then there's Australia – currently the single biggest holding pen for Irish domestic unemployment. The fallout of a burst bubble in China will be especially chronic for Australia, which has developed its own massively inflated property bubble (homes in its cities are now among the most expensive in the world) and where much of the recent economic boom has been built on mining vast amounts of construction-related commodities and flogging it to the Chinese. The Department of Foreign Affairs estimates that there could be as much as 100,000 Irish people in Australia with 40,000 alone travelling there in 2011 alone to flee the recession at home. So if Australia's economy tumbles, a good contingent of that 100,000 – are likely to return home in one great big tranche looking for jobs or dole. Finally, Chinese buyers have been making up a small but significant chunk of the buying contingent at Irish monster property auctions and stressed sales of late. These are the purchasing arenas in which they are publicly visible – they have also been active behind the scenes in the private treaty market. Chinese-based parents who are funding their children's purchases are helping the Irish property recovery. Just some reasons why we may not be able to ignore the expiry of the mother of all housing bubbles – however far off our radars it might seem today.